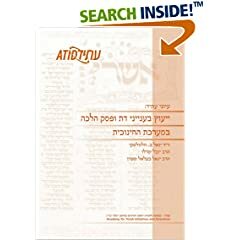 In our "Notes From ATID" series, we recently published Dr. Joel B. Wolowelsky's Hebrew monograph exploring the nature of counseling religious students vs. pesak halakhah (rendering decisive legal rulings on matters of Jewish law), the tensions between them, and the integrity each possesses as a religious and educational act. Dr. Wolowelsky's essay is followed by responses from Rabbis Yuval Sherlo and Yigal Bezalel Shafran. In Israel, order through the ATID office. Abroad, order via Amazon.com. Coming soon in the "Notes From ATID" series: Rabbi Aharon Lichtenstein and Rabbi Yehuda Brandes debate solutions to the challenges of teaching Gemara in high schools (in English).